I'm so excited to share that this holiday season I'm participating in an American Girl doll giveaway with some fellow bloggers. Enter today and you could win your very own Grace Thomas to absolutely make the holidays of the young girl in your life. Look at her - isn't she pretty? You must know at least one person in your life who would absolutely LOVE to have this doll, right? My daughter has her and she is a beauty. But aren't they all? 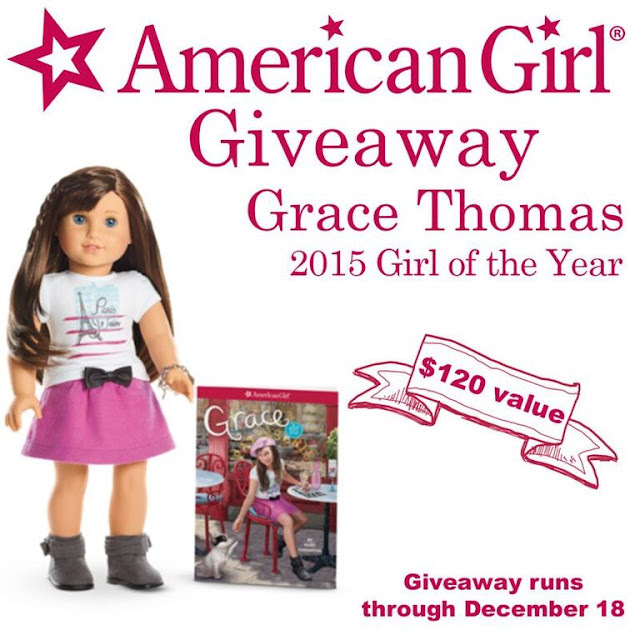 Honestly, if you're entering this giveaway, chances are that you have already heard all about Grace Thomas, American Girl's 2015 Girl of the Year. If you haven't - let me introduce you. Grace loves to bake with friends and invent new recipes. She even has a fun iPhone app of her very own. Check out Sweet Shop by American Girl: Mix, roll, bake, and decorate treats in a French pastry shop just like Grace, Girl of the Year 2015. The more tarts, macarons, and other pastries you bake, the more recipes you'll unlock. 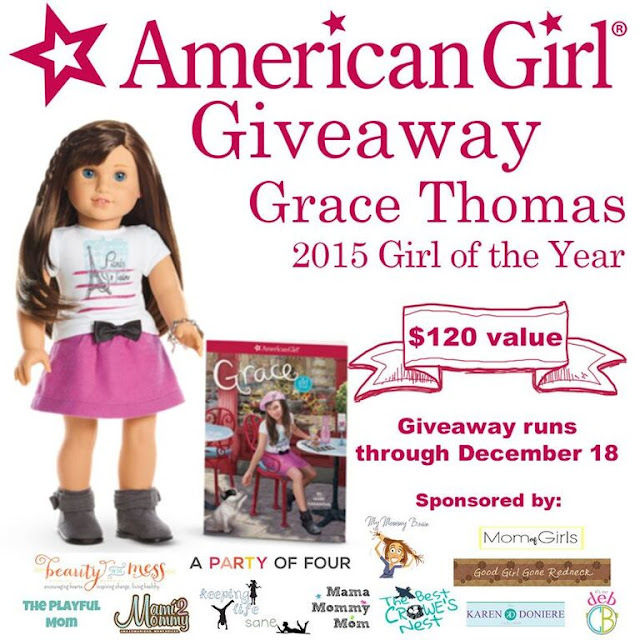 This giveaway is for a Grace Thomas American Girl Doll and a copy of her book Grace -written by Mary Casanova - valued together at $120. Grace is only available for purchase through December 2015 (until supplies last)! This may be your last chance to win Grace so don't miss out. Have a look at my fellow bloggers who are sponsoring this giveaway. Enter below. There are several ways for you to enter and if you're already following me on social media in a few places you pretty much have instant entries. Super easy! I know this is a lonnnng giveaway form, but there are a lot of us sponsoring it, so we each want to give our readers a good shot at winning. Terms and Conditions: Open to US Residents 18 years of age or older. Giveaway ends on December 18th at 11:59 PM ET. Winner will be chosen by random drawing through Gleam.io. Winner will have 48 hours to reply via email to accept the prize or another winner will be chosen. All entries will be validated. Sponsors reserve the right to invalidate any entry at their discretion. I would give her to my daughter. Her birthday is coming soon. I want to wish everyone lots of luck! My daughter loved American Girl dolls, and still has a few in her room. If I won, I'd have to donate it to give another girl that joy, because my son sure wouldn't do justice to her. 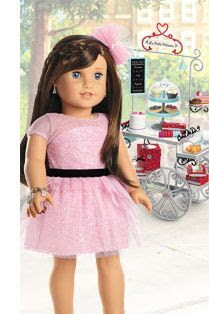 I would give the doll to my daughter, Lizzy, who is a huge fan of everything American Girl! Lizzie loves American Girl Dolls. It would make her so happy if I won. I guess we will see. Grace would make a great addition to our family! My daughter has always wanted an American Girl doll. I'd give Grace to my daughter. Thanks for the chance to win! Our neighborhood school is 63% low income. I'd love to give this doll to a girl at our school this Christmas! My daughter would LOVE this for Christmas!! Thanks so much for the chance! I would give her to my daughter. I would give to my Granddaughter, She has wanted Grace Thomas since she came out this year. (She was watching all the signs of who the new Doll would be and what she does just before they released her) she sent me this link so that I could enter to win her for her. In short winning Grace would be the highlight of her Christmas this year! I wish I could enter more then 2 times but I don't have a Twitter account OR a Facebook Account so I will just enter with the Daily Bonus, and the Comment and check back in tomorrow to enter again! at least I will have 11 chances so far! Good Luck everyone! I would share Grace with my kids. We love AG dolls. I will give it to my Sister. She REALLY wants her. they both love to bake. Goodness, she's a cutie! I'd give her to Claire, but be tempted to keep her for myself!